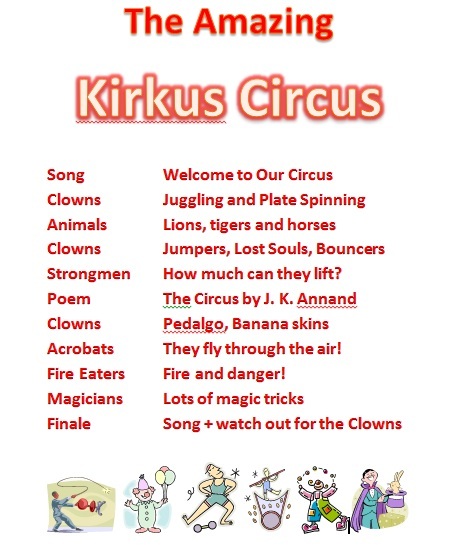 The Amazing Kirkus Circus Performance! 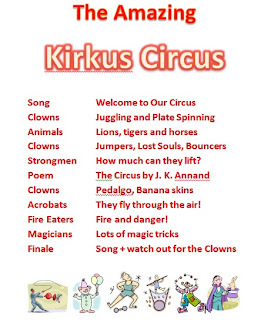 We held our fantastic Kirkus Circus performance on Monday evening with over 120 parents around the circus ring as our audience. The ringmaster set the scene and the band played their instruments with a steady beat so that the performers could keep time. The animals stood on their hind legs and jumped through hoops of fire and showed no fear! The strong men gave us their poses and managed to lift nearly 300 Kg altogether - their faces got very red with their efforts! One of the clowns nipped in ran off with the heaviest weight - it was very strange that he didn't find it heavy!! We had other clever clowns who could juggle, spin plates and bounce on the trampette and they even managed to throw water over the audience without getting caught! Our acrobats flew gracefully through the air spinning their ribbons and even tried to tightrope walk backwards - what an accomplished team! The fire eaters and magicians managed to amaze the audience with their tricks and for the finale we sang a song we made up ourselves called 'Welcome to the Circus'. We continued our open evening by taking our parents back to the classroom and completing some activities. These including reading our senses poems, letters and annotated diagrams. Our maths and art work was on display and we had a vote on the whiteboard about whether it was good to use animals in the circus or not. We drew clowns and gave them funny names. We taught our visitors to juggle, hula hoop, tightrope walk and skip in the breakout area. Everyone had a great time and wanted to do it all over again! Pop stars for a day! We came dressed up as pop stars to raise money for CHAS and Real Radio. Nearly £400 was raised altogether. Can you guess who we are?